We believe everyone should have some of these in their garden. 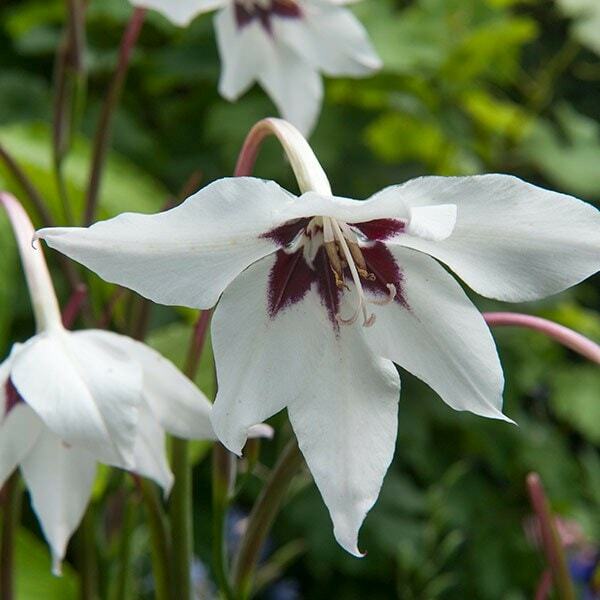 Their spikes of nodding, funnel-shaped, highly fragrant white flowers, each with a prominent burgundy blotch at the base of their petals, seem to dance on the breeze at the ends of their slender stems from late summer onwards. 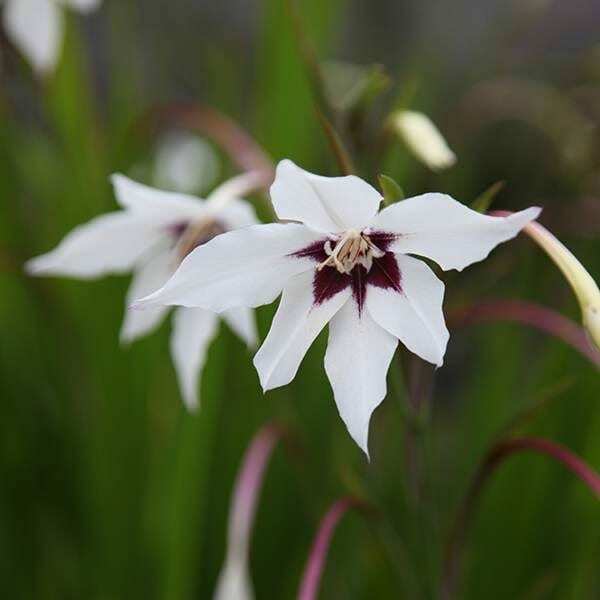 An elegant plant, it is ideal for adding movement to a sunny border, and they give masses of flowers at a time of the year when little else is. 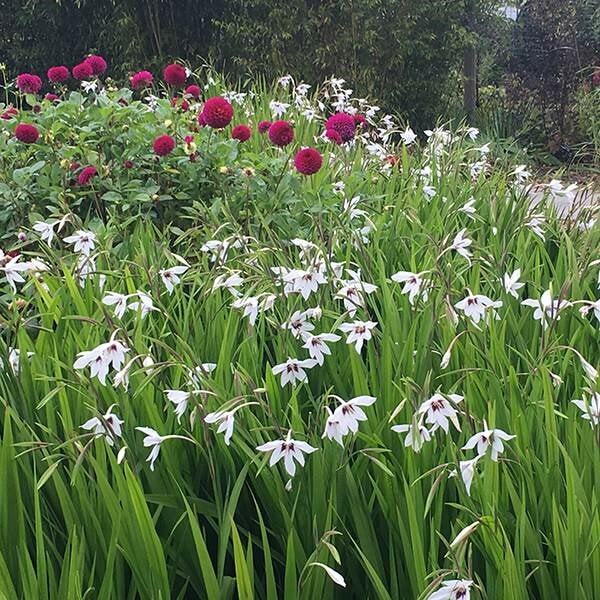 Plant it in clumps throughout the beds, or pot them up (around 15 - 20 corms in a 30cm pot) and keep them on the patio next to a seating area or often-used pathway, where you will be sure to make the most of the heady scent. They are cheap as chips considering the dazzling show they put on in their first year, but treat them the same as you would a annual and replace them every year (or two) to keep the display fresh. 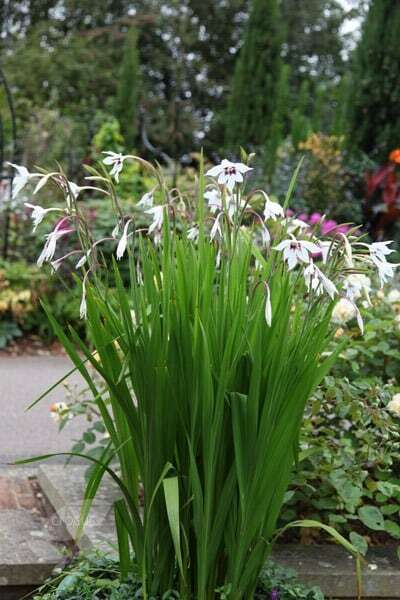 Garden care: Plant corms 10-16cm (4-6in) deep in spring, on a bed of sharp sand to aid drainage. In frost-prone areas, lift them when the leaves turn yellow-brown and store the corms in a dry, frost-free place over winter. Love the look of these bulbs and they smell beautiful. I'm currently 'overwintering' them so still to see whether they perform well again this year. I loved the flowers very delicate shades. Used it in back garden. Appreciated the flowers. I believe these probably need a really good summer in order for them to do well. I did have mine in pots to give good drainage but living in Scotland as of late the Summer weather has been pretty short and sweet. Better off planting down South I think. I bought these for cutting but found that they wilted very quickly, however, as a highly scented garden display flower in pots near the back door these are sensational. hi, I would like to grow these near my conifer trees. Will they be able to grow . Hello there The issue might be that the conifers will take a lot of moisture and nutrients out of the soil and cast shade over them. These plants like full sun with a free draining soil, but they do need moisture. Hope this helps. I grew a pot full of these last year and ended up with a lot of leaves but no flowers,what did I do wrong? Hello there There could be a number of reasons, - if they are planted too late in the season then they might not flower, or not enough sun as they sun do like full sun, or maybe planted too deeply- they should be planted between 10-15cm deep, or the corms were too small, or overcrowding in the pot, or even that the soil is too rich in nitrogen so they are producing lots of leaves rather flowers. Sorry I cannot give you a definite answer, but hope this helps.